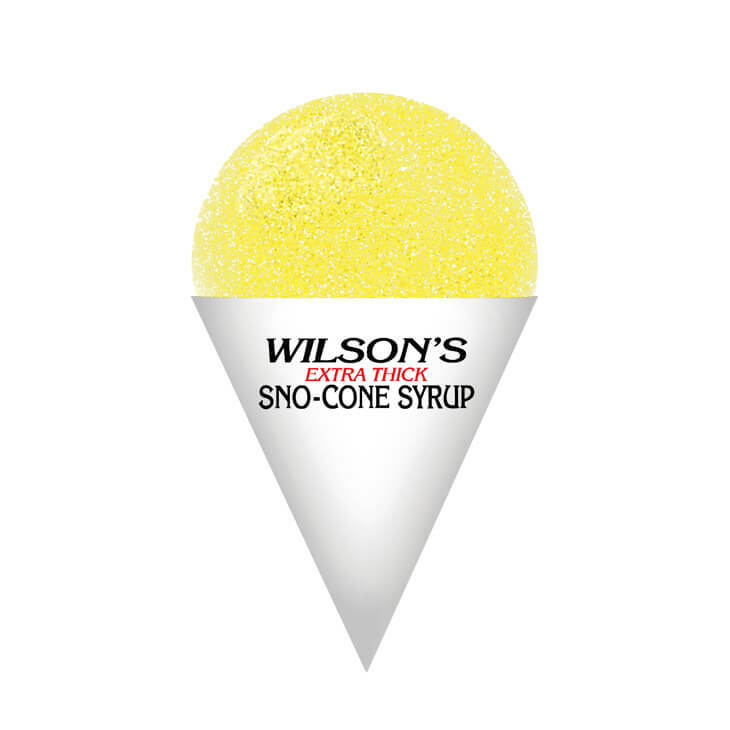 Our Wilson's Banana sno cone flavor is one of our top selling flavors! Enjoy the flavorful taste of fresh tropical bananas as you cool down during the summer days with a sno cone. High Fructose Corn Syrup, Filtered Water, Propylene Glycol, Natural and Artificial Flavors, Citric Acid, Titanium Dioxide, Xanthan Gum, , Sodium Benzoate, Potassium Sorbate, FD&C Yellow #5. 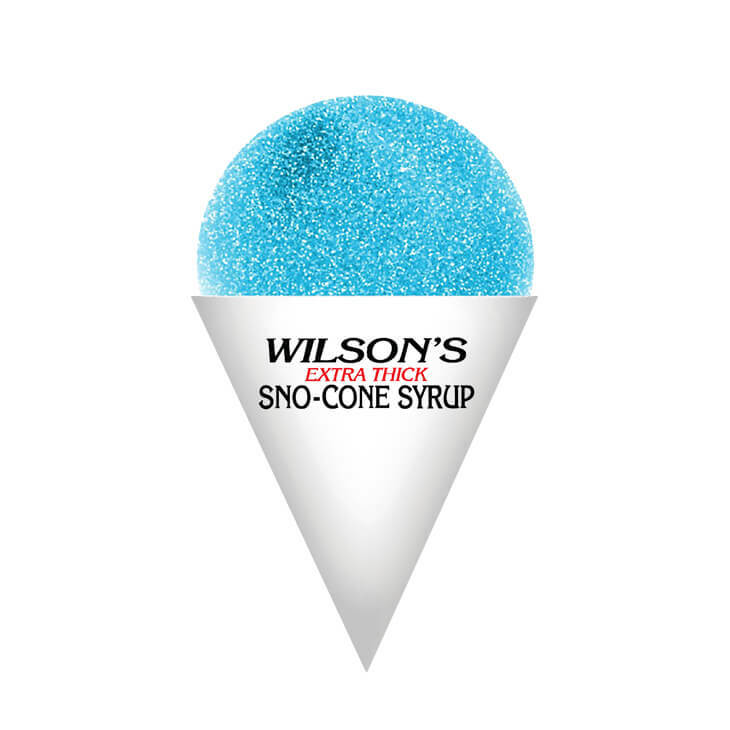 Our Wilson's Blue Bubble Gum sno cone flavor is one of our top selling flavors! Take a walk down memory lane with this fun flavor you loved as a kid. High Fructose Corn Syrup, Filtered Water, Propylene Glycol, Natural and Artificial Flavors, Citric Acid, Xanthan Gum, Sodium Benzoate, Potassium Sorbate, FD&C Blue #1. Our Wilson's Blue Coconut sno cone flavor is one of our top selling flavors! Imagine yourself sitting on a tropical island as you enjoy this bright, fun flavor. High Fructose Corn Syrup, Filtered Water, Propylene Glycol, Natural and Artificial Flavors , Xanthan Gum, Citric Acid, Sodium Benzoate, Potassium Sorbate, FD&C Blue #1. 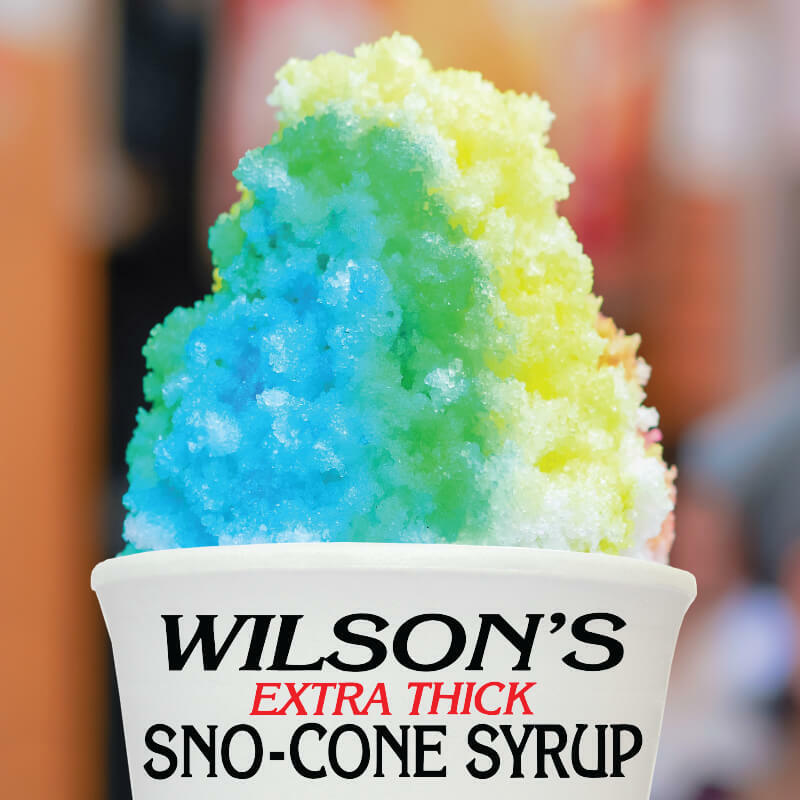 Our Wilson's Blue Raspberry sno cone flavor is one of our top selling flavors! Bright in color and both sweet and tart in taste, our Blue Raspberry flavor is a fan favorite that will not disappoint. High Fructose Corn Syrup, Filtered Water, Citric Acid, Propylene Glycol, Natural and Artificial Flavor, Xanthan Gum, Sodium Benzoate, Potassium Sorbate, FD&C Blue #1. Our Wilson's Cherry sno cone flavor is one of our top selling flavors! Classic in taste and color but flavorful in taste, nobody has ever gone wrong by choosing Cherry for their sno cone. High Fructose Corn Syrup, Filtered Water, Citric Acid, Propylene Glycol, Natural and Artificial Flavor, Xanthan Gum, Sodium Benzoate, Potassium Sorbate, FD&C Red #40. Our Wilson's Cherry sno cone flavor is one of our top selling flavors! Fruity and sweet, offering a nice resemblence to the tasty concord grape. High Fructose Corn Syrup, Filtered Water, Citric Acid, Propylene Glycol, Natural and Artificial Flavors, Xanthan Gum, Sodium Benzoate, Potassium Sorbate, FD&C Red #40, FD&C Blue #1. Our Wilson's Green Apple sno cone flavor is one of our top selling flavors! Sweet and sour in taste, our Green Apple flavor offers a crisp taste loved by many. High Fructose Corn Syrup, Filtered Water, Citric Acid, Propylene Glycol, Natural and Artificial Flavors, Xanthan Gum, Sodium Benzoate, Potassium Sorbate, FD&C Yellow #5, FD&C Blue #1. Our Wilson's Mango sno cone flavor is one of our top selling flavors! A popular tropical flavor that is smooth in taste and vibrant in color. High Fructose Corn Syrup, Filtered Water, Citric Acid, Propylene Glycol, Natural and Artificial Flavors, Xanthan Gum, Sodium Benzoate, Potassium Sorbate, FD&C Yellow #5, FD&C Yellow #6. 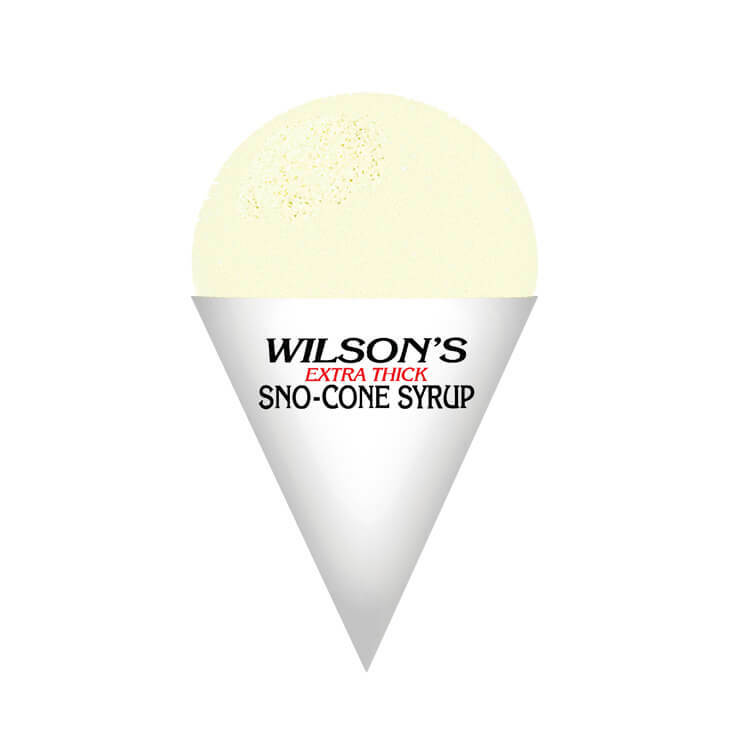 Our Wilson's Pina Colada sno cone flavor is one of our top selling flavors! Take a break from your everyday and imagine paradise as you enjoy the tropical flavor combination of pineapple and coconut. High Fructose Corn Syrup, Filtered Water, Propylene Glycol, Citric Acid, Titanium Dioxide, Natural and Artificial Flavors, Xanthan Gum, Sodium Benzoate, Potassium Sorbate, FD&C Yellow #5. Our Wilson's Strawberry sno cone flavor is one of our top selling flavors! Another classic red that's perfect for summer and will not disappoint. High Fructose Corn Syrup, Filtered Water, Citric Acid, Propylene Glycol, Artificial Flavors, Xanthan Gum, Sodium Benzoate, Potassium Sorbate, FD&C Red #40. 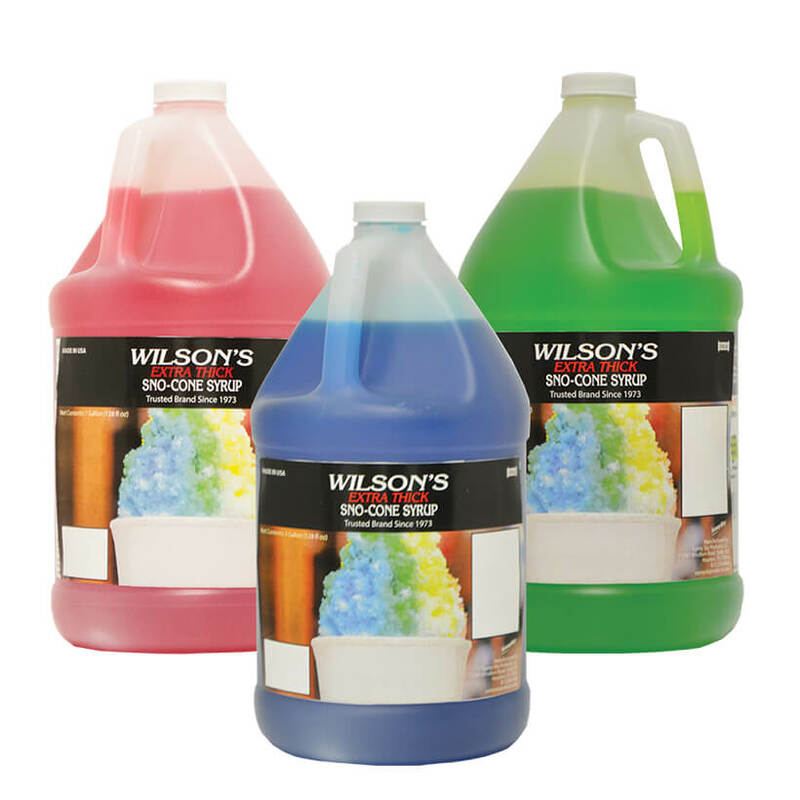 Our Wilson's Tiger Blood sno cone flavor is one of our top selling flavors! With a name like that, how can you not love it? High Fructose Corn Syrup, Filtered Water, Natural and Artificial Flavors, Propylene Glycol, Citric Acid, Xanthan Gum, Sodium Benzoate, Potassium Sorbate, FD&C Red #40. 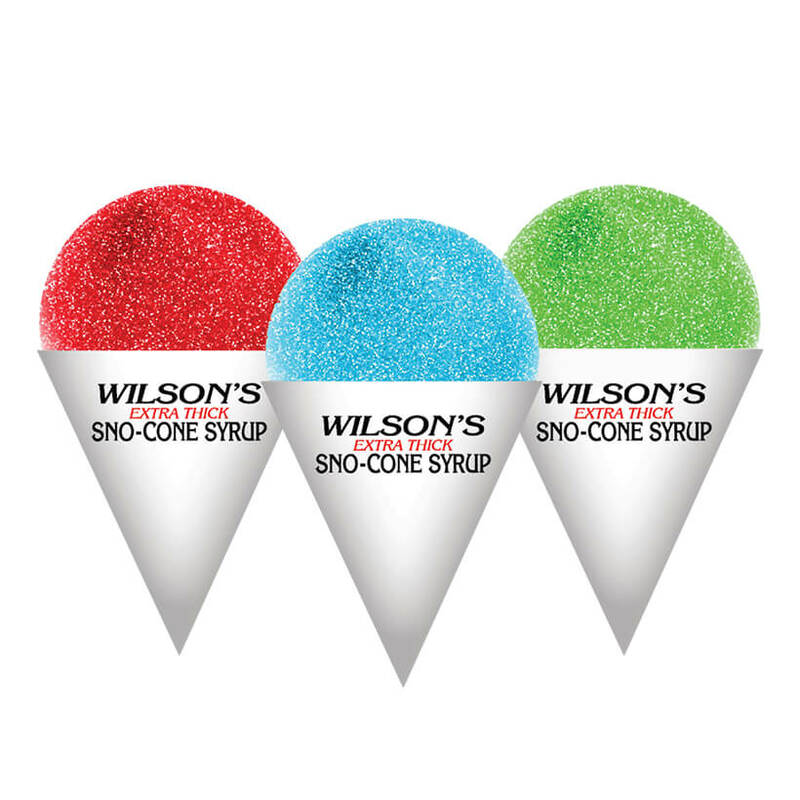 Our Wilson's Watermelon sno cone flavor is one of our top selling flavors! Another tasty flavor that will cool you down during the summer months. High Fructose Corn Syrup, Filtered Water, Citric Acid, Propylene Glycol, Natural and Artificial Flavors, Xanthan Gum, Sodium Benzoate, Potassium Sorbate, FD&C Red #40. Our Wilson's Wedding Cake sno cone flavor is one of our top selling flavors! If you like cake icing more than the cake, this flavor is for you. High Fructose Corn Syrup, Filtered Water, Propylene Glycol, Natural and Artificial Flavors, Citric Acid, Titanium Dioxide, Xanthan Gum, Sodium Benzoate, Potassium Sorbate.